Ken leading a group to Eagle Cliff. 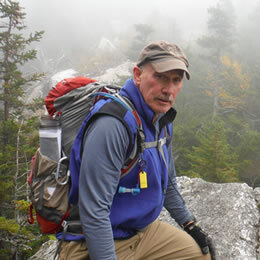 Introduction: Ken, of Amesbury MA, began hiking with the Boy Scouts, summitting Mt.Washington at age twelve. He has since hiked the New Hampshire 48 4000-footers a few times, the 52-With-A-View, the Terrifying 25, the Vermont 4000-footers as well as the Adirondack’s 46 4000-footers. He is currently looking forward to finishing up the Northeast 113. He has hiked and backpacked throughout the US and internationally (see Résumé below). Ken also enjoys off trail bushwhacking. During the early 1980s he worked as a forester throughout the Northeast and now donates his time as a land steward for the Society for the Protection of NH Forests (SPNHF). Ken has been organizing and leading Meetup hikes for several years. When not hiking he enjoys cycling (both road and mountain), fishing, kayaking, cross-country skiing, and a good craft beer. Résumé: Hiked the NH 4000-footers several times in all seasons. Climbed Mt. Whitney in Calif, twice, Mt. Rainier, Mt. Baker, and Mt. Adams in Washington, as well as an extended backpack up through Rainy Pass, Sisters Wilderness in Oregon, Wind River Range in Wyoming, Mt. Washburn in Yellowstone as well as many hikes in major National Parks. Internationally Ken has trekked the Haute Route in the Swiss Alps, the GR 20 in Corsica, the Northern Alps Kamikohchi in Japan, and the Inca and Santa Cruz Trails in Peru. Additionally, he has climbed above 19,000 feet on several glaciated peaks including Mt. Pisco in Peru and Mts. Chimbarazo and Cayumbe in Ecuador. A: Oftentimes when I think of the Whites there is a smile on my face along with a feeling of serenity. The Whites are a special place, unmatched anywhere else. I love to get out on and off the trails and explore. It really makes me feel alive. There is a richness in these mountains that is there for all to see alongside of the fantastic summit views. A: I love the outstanding views from an open summit, the physical challenge of a scramble up a steep slope, the animals, as well as the company of friends. It is also a great source of serenity and wellness. A: Come out and immerse yourself. The Whites, like many mountains, can work magic on your soul. Drink it in!